With over 200 works - paintings, sculptures, drawings, tapestries, art objects, furniture - the exhibition evokes in a magnificent manner the fascination and the presence of the Antique at Versailles at the time of Louis XIV. This is a fascinating story and a feast for the eye. Isis, the "Great Goddess", was chosen to welcome visitors : draped in her somber monumentality, she dominates the entrance to the exhibition with her majestic and spectacular elegance (ill. 1), inviting us to penetrate into this "gallery of stone" to meet the antique white marbles. 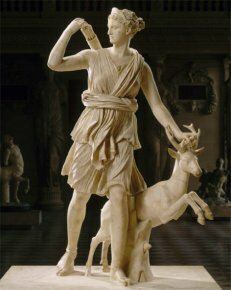 Diana, Venus, Minerva, Apollo are all there, greeting us in their mute eloquence. Fake metallic yew trees offer a contrast with the white marble, and simple white sheets transform the 19th century historical effigies commissioned by Louis-Philippe into mysterious ghosts, cleverly camouflaged. Theatrical perhaps, but this presentation nonetheless serves its purpose well, underscoring the subject and, above all, enhancing the works. Although we are familiar, or think we are, with these masterpieces from the Louvre and Versailles, we most probably have never seen them in this way. Staged by Pier Luigi Pizzi, the famous Italian opera director and decorator, the setting is a remarkable backdrop for the project organized by the curators Nicolas Milovanovic, Alexandre Maral, Geneviève Bresc-Bautier and Jean-Luc Martinez. late 4th century, early 3th century B.C. second half of 4th century B.C. First presented in the rotunda of the Orangerie at Versailles in the 17th century, the statue of Isis then joined the collections at the Musée du Louvre in the early 19th century. When the exhibition ends, she will finally return to her original location. Several Versailles ensembles are thus recreated in the gallery : the sculptures from the arbor in the Salle des antiques, and the Muses from the gardens in Marly, surround the famous Smyrna Apollo. We stop in front of the two Agrippina Mazarin facing each other, the Venus from Arles (ill. 2), Cincinnatus (ill. 3) and the Diana from Versailles (ill. 4), immortal masterpieces of antique statuary. Next to them, six 17th century sculptures respond to their illustrious models and show the importance of the influence of the Ancients over the Moderns during the Grand Siècle. The first of these was Louis XIV, the greatest collector of antiques in the history of the French monarchy. How was this impressive gallery brought together ? How did it encourage artistic creativity ? This is what "Versailles et l’Antique" attempt to demonstrate. After leaving this luxurious ante-chamber, the exhibition continues in the Salles d’Afrique and Crimée, unfolding the history of the fascination with Antiquity at Versailles, this "new Rome" imagined by Louis XIV. By identifying himself with the Sun and the god Apollo, the sovereign inaugurated a veritable cultural policy intended to serve his reign. Mythology became a mirror, a metaphor for virtue and government claimed by the king as his own. In the Salle de Constantine, the luminous evocation of "the Sun palace", around the Latona group (ill. 5), reveals the extent to which the antique concept of harmony between the planets and the seasons was generously exploited by La Fosse, Jouvenet and Coypel. Louis XIV’s passion for the Antique was not supposed to just decorate the royal residences or mark the magnificence of his reign, it was also meant to inspire and train the artists, painters, sculptors as well as the architects, gardeners and decorators, not to mention all of the poets and intellectuals of the time. On the third floor of the visit, the Salle du Maroc is devoted to "Héros et héroines antiques". Here again, the staging is exemplary : assembled in the middle of the room, the skillfully lit marble busts and sculptures stand out in contrast to the paintings and tapestries surrounding them. The world of Antiquity evoked here takes us beyond the boundaries of Rome and Greece : Babylon, Persia, Rhodes, the Scythians provided themes used by Rubens (Tomyris Queen of the Massagetae Scythians) (ill. 6) and Charles Le Brun (the tapestry series of The History of Alexander). An instrument of power, Antiquity, barely concealed as a metaphor of the present, asserted and legitimized power and its principal representative : the monarch himself. Following the inevitable and very elegant evocation of the "Parnassus", blending drawings and paintings around the tapestry after Mignard, the one highlighting "Antique materials" is just as stunning for the quality of the masterpieces on view - vases of porphyriy, yellow marble, alabaster, dark blue marble, the statuette of the Child Draped in a Coat, busts of emperors or of an anonymous vestal ... - and that of their presentation, calling forth the Versailles of Louis XIV. The taste of the sovereign and the ostentation of the collections imposes itself here in an atmosphere evoking the 17th century. This room opens out onto a small gallery where the "Sculptures inspirées de l’Antique", Atalanta (ill. 7), Hippomenes and Venus callipyge are enhanced by natural light. Copies, reinterpretations, sources of inspiration, the antique models were an inexhaustible repertory of forms and themes, revisited by the great sculptors of the time, Flamen, Lepautre and Coustou. 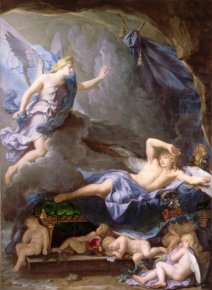 Providing more surprises, "Mythologie galante" presents "plombs" by Tuby (Cupid) and Legros (Aesop), not far from a magnificent Houasse (Iris Revealing Morpheus) (ill. 8), while the room evoking the "Permanence de l’Antique au XVIIIe" displays remarkable woodpanelling from the Cabinet des Muses (attributed to the Rousseaus) alongside allegorical portraits of Mesdames [Louis XV’s daughters] or court favorites by Nattier and Drouais. Although the end of Louis XIV’s reign put an end to the pursuit of this ostentation at court in favor of a more intimate expression, it did not break with the predominant trend in the taste for the antique. The visit ends with the little known maps and drawings (ill. 9) of Louis XVI’s "Grand Projet", a gigantic architectural dream and the particularly impressive miniature marble colonnade, in Sèvres biscuit and gilt bronze, known as "du mariage du Dauphin" [the Dauphin’s wedding]. The style changed - the archeological discoveries, among others, modified the vision of Antiquity - but the Greco-Roman references remained very much present, and would soon lead to Neoclassicism. But that is yet another story. One leaves the exhibition bedazzled, having experienced a perfect blend of erudition and instruction, well served by a museum setting which contributes to an understanding of the subject as well as satisfying the eye. This is especially true since the organizers had the excellent idea of eliminating explanatory texts - generally responsible for traffic jams and jostling -, replacing them with small leaflets available to the public. "Versailles et l’Antique" thus reestablishes the tradition of major exhibitions at Versailles such as those highlighting the treasures in Dresden and "Tables royales". Curators : Nicolas Milovanovic, Alexandre Maral, Geneviève Bresc-Bautier and Luc Martinez. Collective work, Versailles et l’Antique, 2012, Editions Artlys, 336 p., 50€. ISBN : 9782854955125. Visitor information : Château de Versailles, RP 834, 78008 Versailles Cedex. Tel : +33 (0)1 30 83 78 00. Open every day, except Monday, from 9 am to 5:30 pm. Admission : 15€, château + exhibition.